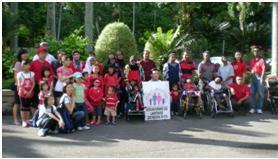 The Malaysian Rare Disorders Society (MRDS) together with the Kiwanis Club of USJ (Kiwanis) organized a visit to Zoo Negara on 26th June 2010. Eight families participated in the visit. It was a special day for the MRDS families as it was a rare opportunity for them to go out on a family outing. The families started with a stroll around the zoo. The children were excited to see giraffes, elephants, monkeys and all sorts of animals up close. The group then proceeded to the animal show where the children enjoyed watching a parrot, a kite, a seal and a sea-lion performing tricks. Later, the families were treated to lunch at a restaurant in the zoo. Kiwanis also gave goodie bags to the children. After lunch, it was time to say good bye. Some families enthusiastically pressed on to explore another part of the zoo. The visit was indeed a memorable experience for both parents and children. They had a delightful time of bonding with each other. We are grateful to Kiwanis who organised the programme and sponsored the lunch and tickets. Thank you, Kiwanis!